Please be aware of CASA regulations before flying a drone. There are heavy penalties for non-compliance. By Callen Thompson, Senior Extension Agronomist, Katherine. Drones have many applications, and agriculture is fast becoming a major user of drone technology. Recent changes have allowed commercial users such as agronomists, researchers and primary producers to use sub two kilogram drones legally. This is great news, but where can you fly them and what are the rules? The Civil Aviation Safety Authority (CASA) has just released an app called “Can I fly there?” The app uses the location technology on your phone to tell you if you can fly your sub two kilogram drone at your current location or at the location indicated by where you move the pointer. It also has links to the rules and regulations around using drones for commercial and recreational use. 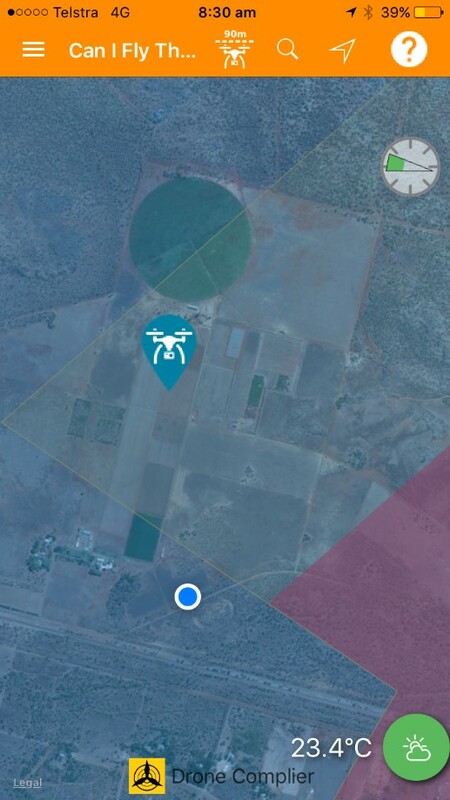 I thought I would test the app out at the Katherine Research Station (KRS), which as we know whenever we hold an outdoor field day, is close to the Tindal RAAF Base. The screen shot below shows where we are on the map. This is in the approach zone of a controlled airport. 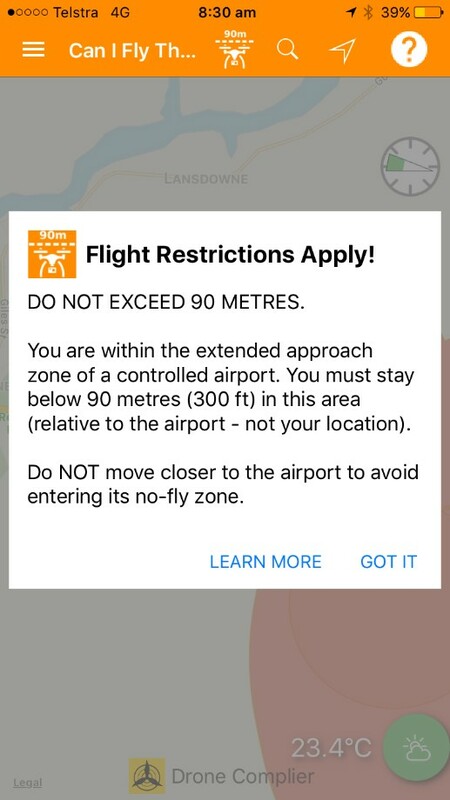 The app then tells me that I am not to fly 90m above the height of the airport. If I want to know more about these requirements I can follow the link, “LEARN MORE”. This is a great tool for anyone flying a sub two kilogram drone. I was unsure if I could use a drone at KRS, but now I know I can if I follow the directions outlined by this app. Search for “Can I fly there?” in your app store or on their website.